1005 Siphonic Roof Drain - Jay R. Smith MFG Co. Smaller Pipe Diameter, Single Point of Discharge,Reduced Material Cost, Eliminates Slab Penetration Costs. Fatiguing drain lines have the potential to cause serious problems if they fail. Even if no work could be done inside or under the facility, a great option is to tackle the problem overhead using a siphonic system. The solution solves the problem without disrupting anything in the facility or cutting into concrete to run piping to the storm culvert. The siphonic drain is just one component in a siphonic drainage system. These systems should always have the approval of a plumbing engineer, licensed in the locale where the installation is to occur. For use in engineered siphonic roof drainage system. May be used in flat roof of any construction. 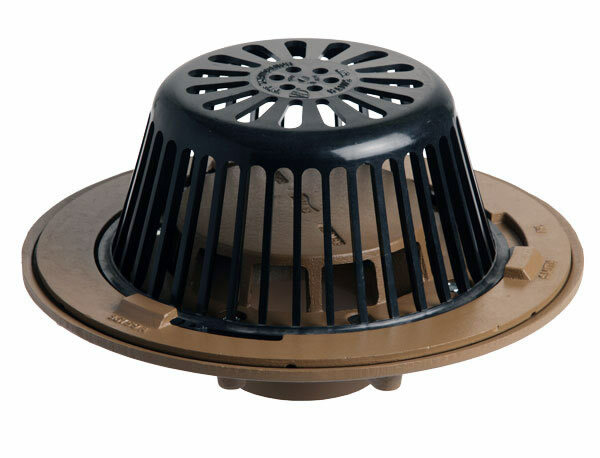 Large low profile dome provides sufficient free area for quick drainage of rain water and protects the drain sump, baffle and connected piping from the intrusion of debris. Internal air baffle creates siphonic drainage action producing more efficient drainage than traditional roof drains. Full-bore flow within the piping reduces pipe diameter as compared to open channel, traditional gravity flow, which operates at 1/2 the capacity. Siphonic action is independent of pipe pitch or gradient. Horizontal piping is not pitched. The invert leaving the building is eliminated. Smaller pipe diameters allows maximum use of open space without intrusion of drainage piping. This also reduces material costs. The point of discharge for the roof can be concentrated to one corner, typically, rather than out of the building in several points. Flexibility of Stack Placement-The ability to run drainage pipe horizontally overhead gives the designer the opportunity to combine several drains into one manifold and one stack. So it is possible for a building's roof drain system to use one eight inch stack (just for example) instead of three eight inch stacks . Being able to design the location of the stack(s) aides in the design of a rainwater harvesting system, a Green Building solution. Duco Cast Iron Body, Flashing Clamp, Air Baffle and Polyethylene Dome. Article: Siphonic Roof Drainage: Where Is It Headed? Article: "Are Proprietary Siphonic Roof Drainage Systems Necessary?"